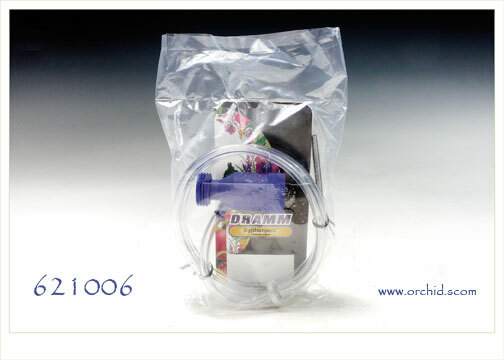 An Easy way to feed your orchid collection with this simple Fertilizer Injector. Thie Syphonjeet Orchid Fertilizer Injector is made of solid brass and is manufactured with a built-in backflow preventer. Syphonject draws a concentrated solution from a bucket through a flexible suction tube and them dilutes it with the passing water stream and an approximate ratio of 16 parts water to 1 part of concentrated solution. For example, for ever 1 gallon of concentrated stock solutioin you put in 16 teaspoon of Norman's Optimum Orchid Nutrients. Use item A000064 Low Pressure Soft Rain Orchid Water Breaker for optimum fertilizer output with reduce water pressure from the injector.